The 'Comparsa Negra' (Black Comparsa) or Carnival 'Lubola', is a ritual with profound religious symbolic content, dating back to the ceremonies of a closed and secret Candombe cult of Spanish Colonial times. 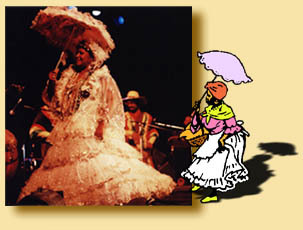 The Comparsa brings together established characters who are typical of Candombe, such as the 'Mama Vieja' (Old Mama), the 'Gramillero' (Herb Man) and the 'Escobero' (Broom Man) and a large number of dancers of both sexes, vibrating to the rhythm of the drum corps. * The Old Mama represents the housekeepers of Colonial Montevideo residences. She wears a flowing skirt, usually white, with many frills, and a blouse to match. A fan and a parasol complete her costume. * The Herb Man represents the witch doctor or medicine man who performed cures with herbs and potions. He is an old man with a white beard, wearing a traditionally black tail coat, bowler hat and carries a walking stick and a case supposedly containing medicinal herbs. This character in his dancing trembles violently and contorts his body to symbolize possession by spirits in a religious allegory which is essentially a pantomime. 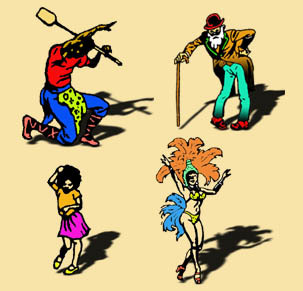 * The Broom Man represents the stick twirling expert of many African tribes. He juggles and tosses a small broom. He wears a leather apron jingling with little bells and sequins, and is tireless in varying his performance. Both men and women make up the dance corps. Some young women through their beauty and vivacity become real stars of the dance and wear luxurious dresses covered with feathers, colored beads and chiffon. In the past Marta Gularte and Rosa Luna were among the most famous stars of the Comparsa, and today Tina Ferreira and Florencia Gularte are foremost. 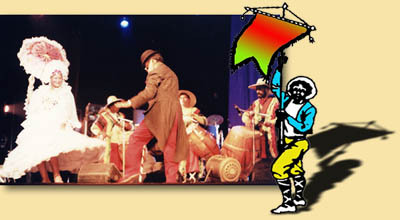 In addition to the traditional characters of the Comparsa and the dancers vibrating to the rhythm of the drum corps, others are always present, including the standard bearer with his banner covered with stars and crescents, and the banner wavers who keep their flags undulating in the air. The drum corps joins the comparsa at Carnival and on holidays, with more than eighty drummers beating the Chico, Repique and Piano drums and achieving incredible synchronization. Together they weave multiple rhythms into a deeply complex and harmonious whole. Separately they are to be found in the places where people traditionally go in their leisure time, like the Tristán Narvaja Fair and the Port Marketplace. On Sundays the various groups gather in the streets of the Sur and Palermo neighborhoods of Montevideo in the great popular festival known as 'Llamada' (The Call), and the neighbors join in. 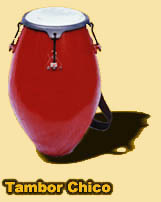 The smallest drum corps, known as a 'Cuerda Mínima' has one 'Chico' drum, one 'Repique' drum and one 'Piano' drum. The greater the number of drums in a drum corps, the greater the number, proportionately, of Chico and Piano drums (which set the rhythm) compared with the number of Repique drums (with which the drummers improvise). 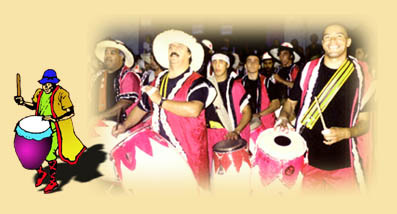 For example, a seven-drum corps is composed of three Chico drums, two Piano drums and two Repique drums, to keep a balance between the number of rhythm drums and improvisation drums. 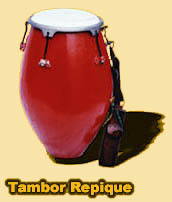 There are two clearly defined styles in Candombe, known as 'Cuareim' and 'Ansina'. These names come from the names of streets in the Montevideo neighborhoods of Sur and Palermo, birthplace of the most important Carnival Comparsas. 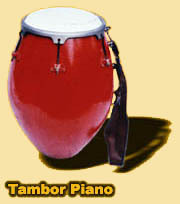 The Cuareim style, the most traditional one, is played at a moderate tempo, and the rhythm is set by the Piano drums, with which subtle variations alternate with the improvisations played by the Repique drums. The Ansina style is played at a faster tempo, and here the Piano drums answer the Repique drums with their own improvisations.